Those who peruse bins and boxes of used records are likely to come across recordings of school bands - those once precious, later forgotten LPs capturing moments of youth. More often than not, these are best left alone, but on occassion, there are those that manage to reflect the exuberance of school days. You can hear that there are many other things in the lives of the players. You can hear the children despite all the formality of the performance. 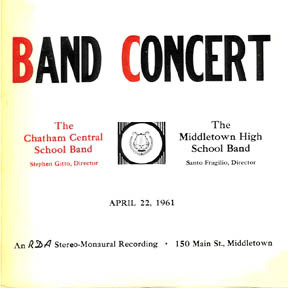 Oddio Overplay presents the 1960-1961 bands of Chatham Central School directed by Stephen Gitto and Middletown High School directed by Santo Fragilio.